Native American Indians were a deeply spiritual people and they communicated their history, thoughts, ideas and dreams from generation to generation through Symbols and Signs such as the Kokopelli symbol. Kokopelli is a fertility deity of some Southwest Native American cultures. Kokopelli is usually depicted as a hunchbacked, dancing flute player. Kokopelli is often shown with a large phallus and wearing antlers or horns on his head. Antlers and horns signified spiritual power, especially when applied to animals that did not ordinarily have them such as Birds, Panthers, Avanyu and Snakes (Serpents). In some tribes the Kokopelli is believed to be a companion to the Avanyu. Symbols of this ancient deity has been found on prehistoric American rock carvings. For additional information refer to Kokopelli. The Kokopelli symbol is represented in a number of guises depicting his role as a source of music making and dancing and spreading joy. 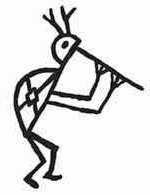 The distinguishing features of the Kokopelli symbol are his hunchback, his dancing pose and his flute. The hunch on his back represented the sack he carried which might contain seeds for the harvest, the songs he carried and beautiful rainbows. The flute he plays symbolizes his music that changes the winter to spring. There are many legends and myths about Kokopelli. He is believed to travel from village to village bringing the change of the season and bringing rain for a successful harvest. The "Rainbow Kokopelli" is a Yei deity who commands the rainbow, giving beauty to all those in harmony. It is thought that his sack was made of clouds full of rainbows or seeds. The "Rainbow Kokopelli" represents the Yei symbol of harmony.